Perfect for your bedroom or kitchen, this 24” HD Ready television has plenty of great features to provide you with hours of entertainment. Looking for a larger size? 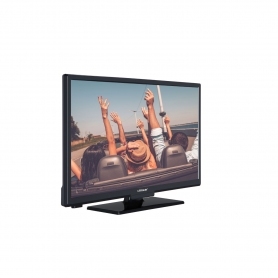 This Linsar TV is also available with a 32” screen. Linsar has designed this TV set with style in mind, and it doesn’t disappoint. The HD24E1 is super slim and liquorice black, so it’s particularly eye-catching when mounted on the wall. If you prefer, you can also use the table top stand, which adds a sophisticated edge. As the Linsar HD24E1 is 720p HD Ready, the set can cope with a high definition signal, even though it’s not full HD. This can be enjoyed if you can watch television through services that have HD capabilities, like Sky TV. The HD24E1 comes with built-in Freeview HD, so you’ll have access to a huge range of TV channels without having to connect an extra device. With Freeview, the days of aimless channel hopping are over. You can choose from over 60 channels that will play everything from reality shows to gripping TV dramas. What makes things even better is that your subscription to Freeview is completely free. There are 12 channels available in HD, such as BBC1 and ITV, so whether you want to watch cooking programmes or the football, you can enjoy them all in epic detail. If you want more than just television in your bedroom, then this Linsar model is perfect. HDMI and Scart connections allow you to connect your games console or DVD player, so you can start using your extra device at the click of a button. A user-friendly remote control also makes the HD24E1 incredibly easy to navigate. Effortlessly browse through the TV guide and simply select your chosen programme. This sleek, compact television packs in a lot of entertainment. It’s exclusive to Euronics and Agents stores, so you won’t find this fantastic model anywhere else. Why not put one in your basket today?